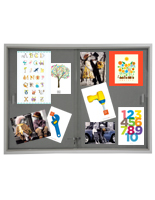 These Cork Boards Are Framed in Aluminum Metal and Suit Any Wall Display! 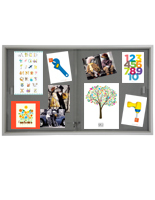 These Cork Boards are Notice Boards Available to Buy! 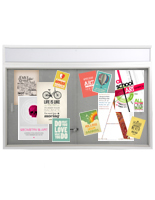 The cork boards, like our bulletin boards or cork boards, have a large posting surface that will firmly hold any of your information. The tack board's gray fabric keeps all push pins, tacks , and staples firmly in place on tack board. 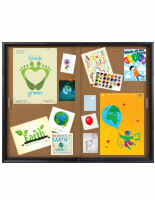 These cork boards come with an aluminum frame that is satin brushed to look attractive while being durable. 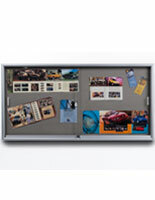 We specialize in cork boards and offer this great new product, very economically priced when compared to other tack boards or message displays. 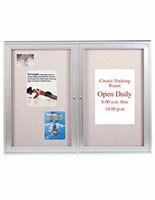 The tack board's interior case depth is 7/8" and overall measurements are 48" x 36". Four corner mounting holes are located on the rear of the display for the mounting hardware of your choice (hardware not included). A message display, like cork boards or a bulletin board, will promote communication, productivity, and information in your community. The benefit of cork boards is that messages and notices can be taken down just as fast as they were put up. 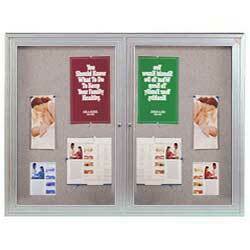 Used frequently in various places, the cork boards are frequently seen in offices, schools , as well as hospitals. 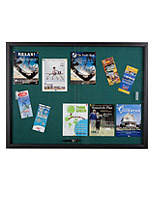 The simple-to-use cork boards are effective message centers commonly used in places like hotels, churches in addition to government agencies.